This month we’ll look at the completion of the brake installation. This phase of the project was held up for quite a while as vendors completed necessary work. Joe at Sierra Specialties had my master, slave, and wheel cylinders for quite a while as he sleeved the bores to alleviate the effects of corrosion. Joe installed brass sleeves in the bores. In this process the original bores are increased in diameter via machining to get back to sound metal. Then, a thin cylinder of brass is pressed back into the bore. The inside diameter of the brass is exactly the same as that of the original bore. Per Joe’s recommendation, I applied VHT Brake Caliper coating to the various parts. Joe likes this spray can product because after the paint air dries, the part can be baked in an oven at around 200 degrees to further set the coating. Joe swears that this 2 step process will provide a paint coating that can withstand brake fluid. This is important as brake fluid will typically dissolve paint if spilled. I choose the cast aluminum color. As I mentioned in a previous article, the vacuum assist unit for the slave cylinder was sent out to Industrial Electroplating in Gastonia for zinc plating. Now that I had the various cylinders, I could complete installation of the rubber seals. I had obtained rebuild kits from Terry’s. These kits contain all of the necessary rubber parts and some metal and plastic parts that are prone to wear or breakage. Cleanliness is very important during the re-assembly process! . Lube all of the parts with brake fluid during assembly. It is best to refer to the exploded diagrams in the Bentley shop manual when assembling the parts back into the master and slave cylinders. Assembly of the wheel cylinders and the caliper assemblies is much more straight forward. The wheel cylinders only use one seal and a dust cover. Once these parts are ready, you can install them on the car. I admit I am a little out of sequence with respect to my series of articles, as the calipers should be and were installed on the IRS prior to installing the IRS into the car. 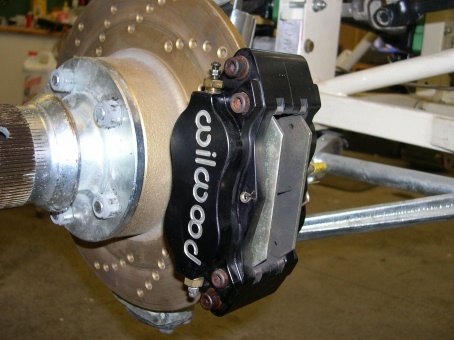 Once the IRS is in the car, little or no access is available to the brake parts. Of course, access to install the front calipers, the master cylinder, and the slave cylinder is much easier. Once these key components are installed, it’s time to add the lines for the hydraulic fluid. I chose to buy pre-bent tubing from Classic Tube. Classic Tube is a leading supplier of brake, clutch, and fuel lines fabricated from stainless tubing. They have patterns for thousands of automotive applications. They can also bend tubing from your existing parts using a digital measurement transfer system. They were backed up when I placed my order and I had to wait several months for my order to arrive. Once I had the stainless tubing in hand, I laid out the various pieces to establish how everything went. It was a little bit of a jigsaw puzzle but I finally got it figured out. The tubes were very accurate but still some local tweaking was required to get the various fittings to line up. 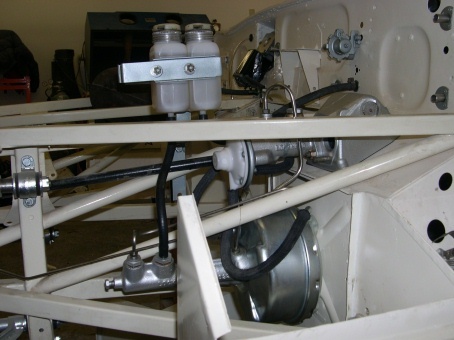 Additionally, there are flexible lines from the front frame to each of the front calipers and a flexible line from the rear of the cockpit to the IRS. The original lines would be rubber hose but a newer product is available that is constructed with plastic tubing protected with a stainless mesh cover. These plastic lines are very stiff and thus do not expand as much under the extreme pressure applied during braking. The net effect is a firmer feel at the peddle during braking. 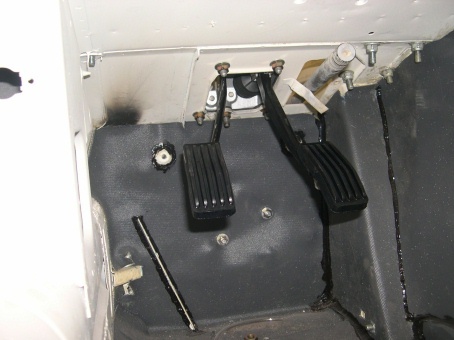 The brake and clutch pedals hang from a peddle box, which sits on top of the firewall. I painted the part of the peddle box that is exposed to the engine compartment with the same paint I painted the calipers with. Inside, the hanging peddles were painted black. New rubber pads were also applied. Finally, I installed new return springs that I had purchased from Terrys. With the hydraulic plumbing hooked up and complete, I turned to the vacuum lines. You need to refer to the diagram in the Bentley manual carefully so as to get the lines hooked up correctly. I also blasted and painted the vacuum reservoir and installed it at its location inside the engine compartment. Finally, I blasted and painted the brackets that hold up the hydraulic fluid bottles. The bottles themselves were so shabby that I bought new ones. With everything hooked up, it was time to fill the system with hydraulic fluid and bleed the system. I own a simple pressure bleeder system, which is a cap that fits on top of the hydraulic fluid bottle, a spare bottle, and some hoses that hook up to an automotive tire inflated to about 15 psi. The spare bottle is filled with hydraulic fluid. I used Castrol DOT4 fluid. Once the spare bottle is pressurized with the air pressure from the tire, you go to the bleeder valve at the farthest caliper, i.e. the right rear and open the bleeder valve. Eventually the pressure bleeder expels the air from the system and fills it up with fluid. You then repeat this process for the 3 other calipers. 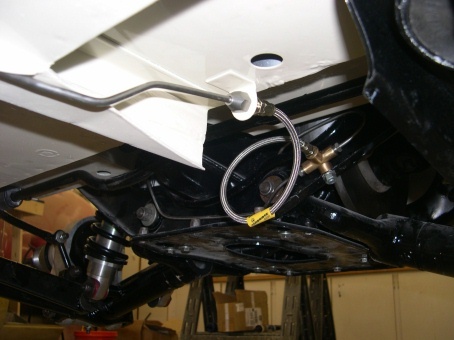 This system avoids the old fashion method of pumping the brake pedal. When the system is completely filled with fluid and all air is expelled, you are rewarded with a firm brake pedal in the cockpit. I wanted to also check the vacuum assist. For this, I hooked up a long hose from my other car, turned it on, and applied a vacuum to the reservoir tank on my project car. If you know what you are looking for, you can feel the difference in the brake pedal when the vacuum assist kicks in. As a secondary check, I teed in a vacuum gauge to the inlet to the vacuum reservoir to verify operation of the reaction valve. I was pleased to find that everything seemed to be in working order. Getting the brakes done is a major accomplishment. Especially in light of the fact that the inoperable brakes were one of the main reasons that I started my project years ago. Next month, we will look at installation of the radiator and other engine compartment odds and ends.